There are parts of The Eagle Huntress that are unlike anything that has ever before been captured on mainstream film. There are parts of The Eagle Huntress that are unlike anything that has ever before been captured on mainstream film. 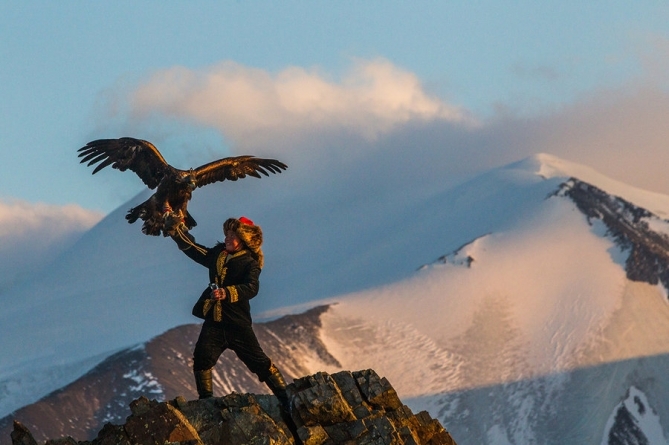 For instance, there is a scene where our heroine, 13 year-old Aisholpan, captures a baby eagle from its nest on a craggy cliff over the Mongolian tundra. Another shot details this eagle, having grown and now under Aisholpan’s firm command, catching and killing an Arctic fox with cold, deadly precision. These moments transcend even the best Discovery Channel moments because they are nestled within a picture about a lovely young teenaged girl, normal in every way except for her extraordinary relationship with her pet eagle. The Eagle Huntress is narrated beautifully by Star Wars: The Force Awakens’ Daisy Ridley, who saw the initial cut of the film at a festival and came onboard to produce and lend her voice to this theatrical version. Ridley’s voice, already a feminist icon in the wake of The Force Awakens’ incredible success, lends a grandiose undercurrent to Aisholpan’s story, which we join just as the young girl is capturing her eagle, a patrilineal tradition that is being passed to her because of her parents’ progressive views and her ease at handling her father’s eagle companion. Aisholpan’s story unfolds dynamically but predictably from there as she takes her eagle to a national competition and then on a hunting expedition. The beating heart of the film is the utterly stunning camerawork, which revels in the natural wonders of Aisholpan and her family’s Mongolian home. The family lives for part of the year in a yurt in a wide, cold field, only moving to a home closer to the city for the frozen winter months. Aisholpan and her siblings attend school in the city, returning to their parents’ home for weekends. Their existence is portrayed as simple but typical, with Aisholpan watching out for her siblings while also maintaining a role in the social order of girls at her school. The only difference is that Aisholpan is their people’s first female eagle hunter, a turn of events that is not lost on the local elders. While The Eagle Huntress is stunningly beautiful, educational and overflowing with girl power, it is also very manipulative. While moments such as the aforementioned extraction of Aisholpan’s eagle from its nest are naturally choreographed, too many other moments feel entirely staged. Most egregiously, Aisholpan wins the tough national eagle hunting competition with little explanation of what she did any better than the dozens of other hunters. The audience is led to believe that it is because of her superior talent, but it comes across as being achieved only because she brought along a camera crew. This is a shame, because at its core The Eagle Huntress is a feminist tale for the ages. Aisholpan is not driven by the need to prove she can do what a man can; she is instead driven forward by the mere fact that she loves eagle hunting and wants to do it. This is an important message to have on screens, and it would be even more powerful if Aisholpan didn’t appear as if she were being instructed on what to do in every shot. The blame for this falls on director Otto Bell, who has made the entire dynamic incredibly interesting but filmed it in ways that feel manipulative and stale. It’s very easy to recommend The Eagle Huntress based on the merits of its powerful message, charming subjects and stunning cinematography. Still, it is impossible not to wonder what the film would have been like had Aisholpan, her family and her people been able to express their true joys and concerns rather than have followed someone else’s script.